As indicated by his family name, Niemann was of German descent but was born in London. He initially worked in the insurance industry at Lloyds but became a full-time artist in 1839, settling in High Wycombe and specialising in plein-air landscapes of the local scenery. It could well have been during this period that the present view of the Abbey of St.Albans, an impressive example of Norman architecture dating from the 11th.century with the longest nave in England, was executed. It is probably taken from the viewpoint of the Gorhambury Estate, a local Palladian mansion, and shows the great crossing tower. The Abbey’s importance, architectural and otherwise, was recognised in 1877 when it was elevated to Cathedral status. From 1844 to 1872 Niemann exhibited at the Royal Academy and from the following year at the British Institution. Other of the artist’s favoured locations were along the Thames, and the area around Swale, near Richmond in Yorkshire. Niemann’s work is mentioned in the critical literature of G.H.Shepherd and Paviere, as well as Christopher Wood’s exhaustive ‘Dictionary of Victorian Painters’ (1971). His son Edward J.Niemann was also a landscape painter in his father’s style. 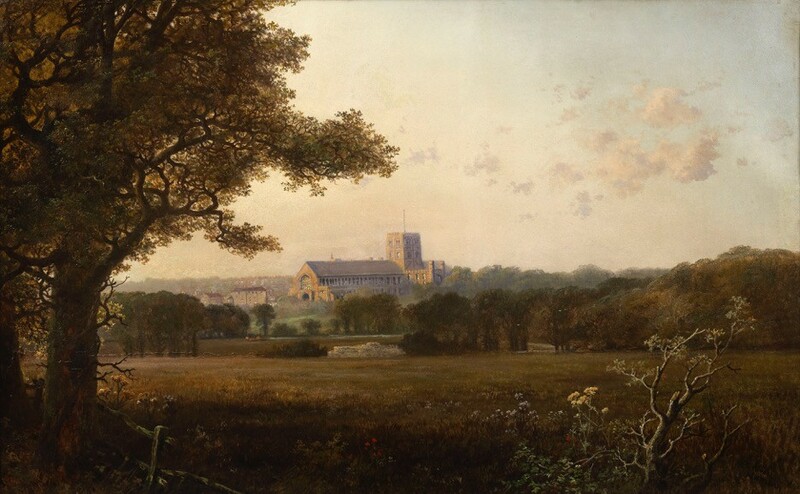 I am writing to enquire about "A View of the Abbey of St. Albans"